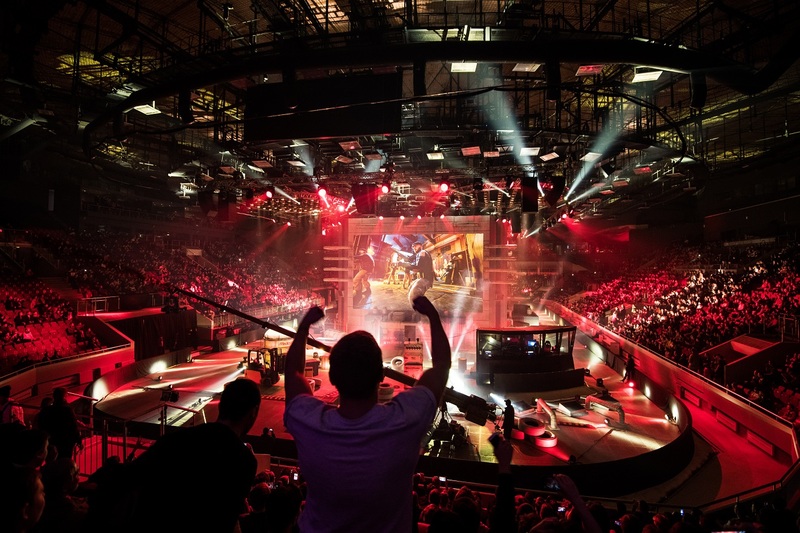 While many premium consumer brands have long histories of sport sponsorship, many have entered unchartered territory by announcing multi-million eSports partnerships this year. In our 3rd article on the eSports phenomenon we look at the details of the biggest and best deals in Germany this year. 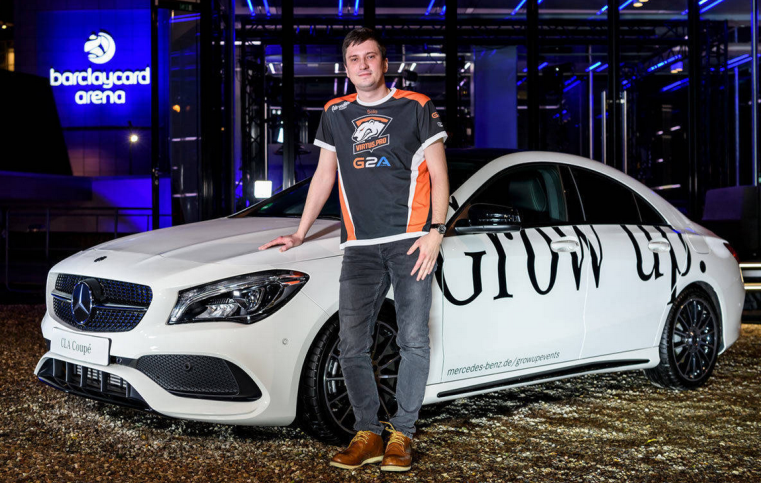 In perhaps the largest and most unique deal of its kind this year, Mercedes-Benz announced in August their worldwide sponsorship of the ESL, the world’s largest and oldest eSports company, which began with the ESL One Hamburg tournament in October 2017. The deal includes full logo rights in and around the arena, short introductory spots featuring Mercedes cars on arena screens and Mercedes cars shuttling teams around the tournament. The brand even offered fans both in the arena and watching remotely to vote for the tournament’s „Most Valuable Player“ and awarded a new Mercedes-Benz car worth € 50,000 to the winner. An Analyst Truck provided by Mercedes Benz stationed outside the stadium provided a home for broadcast talent and analysts to commentate on the tournament. 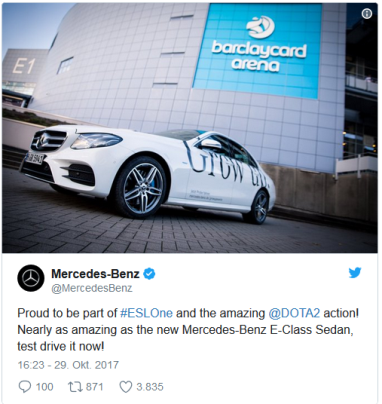 How the car manufacturer interacts with fans on social media is a lesson to all on how to engage with the eSports audience. Fans were quick to criticize the Mercedes deal on Reddit by implying that, their social posts about the partnership, the car manufacturer was only interested in promoting product features. Mercedes-Benz responded to this by “owning” the joke and making fun of themselves (Tweets often ended with an ironic statement “Nearly as amazing as the new Mercedes Benz E-Class Sedan!”), winning praise from the fans for their tongue-in-cheek approach. What makes this deal stand out? Its innovative activation plan, social media reaction and pure scale. 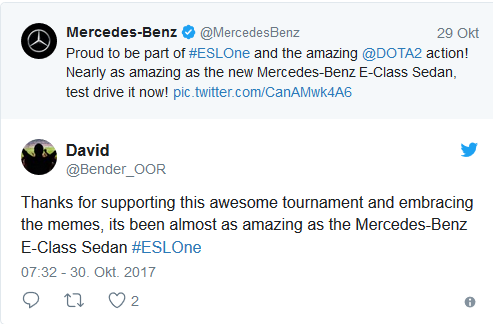 Mercedes, while not the first major car company to invest in eSports (Audi sponsors the Danish Astralis team), is the first car brand to sponsor major eSports tournaments, a huge commitment to the industry. 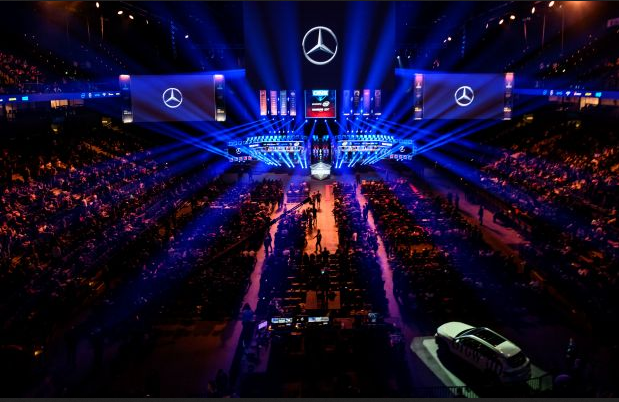 ESL One in Hamburg event alone attracted 10,000 fans to the stadium and millions of fans watched the tournament via TV and live stream. It was a deal which the German eSports industry had been waiting for. In May this year, in one of the first and most significant announcements of its kind in the history of the sport, the international telecommunications brand Vodafone announced their sponsorship of German eSports team Mousesports. They want to hold bootcamps to support and train young players. Alongside results and highlight videos, Vodafone will support Mousesports with high speed internet at practice facilities in Cologne and where players are based around Europe. The Vodafone logo will go on all team shirts, but Toan Ngyuen, partner at creative agency Jung von Matt who devised the campaign, was quick to point out that this deal won’t end up as a “logo graveyard”. “Vital is that a story runs through the digital activation strategy”, he says. Fans will also be able to enjoy content on Mousesport teams on all social media channels of Vodafone and Mousesports, as well as in Vodafone's "Featured" magazine. According to Horizont, the overall package (including costs of activations and rights) is in the six-figure range. It’s appeal to the fans. Vodafone have made clear that the focus is to introduce themselves "piece by piece" as a credible partner of eSports, and are in it for the long term. The synergy is also clear: gamers need high speed internet, and so do fans for live-streaming.